More than 100 Civil War re-enactors left the 21st century behind Saturday to become better at what they spend a lot of their time doing — making history come alive. Cellphones were left in cars and the re-enactors spent the day living as soldiers would have in 1862. The men dressed in Civil War-era military uniforms, carried muskets and drank water from canteens. Rows of shelter tents were set up at Camp Marshall. 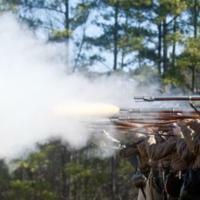 The re-enactors were at the camp for the annual Carolina Legion Camp of Instruction, which is held in February in either Walnut Cove or Wake County. 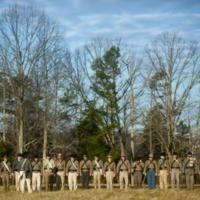 Carolina Legion is the umbrella organization for a number of Civil War re-enactment groups throughout North Carolina. The majority of the men at Camp Marshall belonged to the 26th North Carolina regiment, said Skip Smith, the regiment's commander. The purpose for Camp of Instruction, Smith said, is ensuring historical accuracy in recreating Civil War battles. "We're trying to live as close as they did," he said. For the rest of the year, the men will be re-enacting battles from 1862, Smith said. That includes the famous Battle of Malvern Hill fought July 1, 1862, in Henrico County, Va., near Richmond. The camp, which ends today, is one of the few chances that the re-enactors have to practice military drills, Smith said. "When you do an event re-enactment, there's not a lot of time to do that," he said. "You have to prepare for the battle re-enactments. It's solely about the drills." After the drills, the men re-enact battles so they can put into practice what they learned, Smith said. Many of the men have been Civil War re-enactors for years. Dennis Brooks, who lives in Siler City, said he got his start in the late 1980s when a Civil War re-enactment unit did a demonstration at one of his family reunions. Brooks said he has to invest a lot of time and money to be an effective Civil War re-enactor. When he first started, it cost about $1,000 to buy all the equipment and other things needed. Now, he said, it costs about $1,700. Steve Jones of Jacksonville said he joined a re-enactment group in Alabama after seeing the movie "Gettysburg." He stopped re-enacting for about eight years while he served in the U.S. Marines and U.S. Army. After working for a private security company in Iraq, he wanted to get back in with a North Carolina Civil War re-enactment unit. He said he enjoys it and he even found that an ancestor of his, William Hamilton McCain, fought with Nathan Bedford Forrest, the famed Confederate general. "I get to know more about history than looking in a history book," he said. "It's where history comes alive." Winston-Salem Journal, "Civil War re-enactors meet to make sure they present history accurately," April 8, 2012, Civil War Era NC, accessed April 24, 2019, https://cwnc.omeka.chass.ncsu.edu/items/show/186.